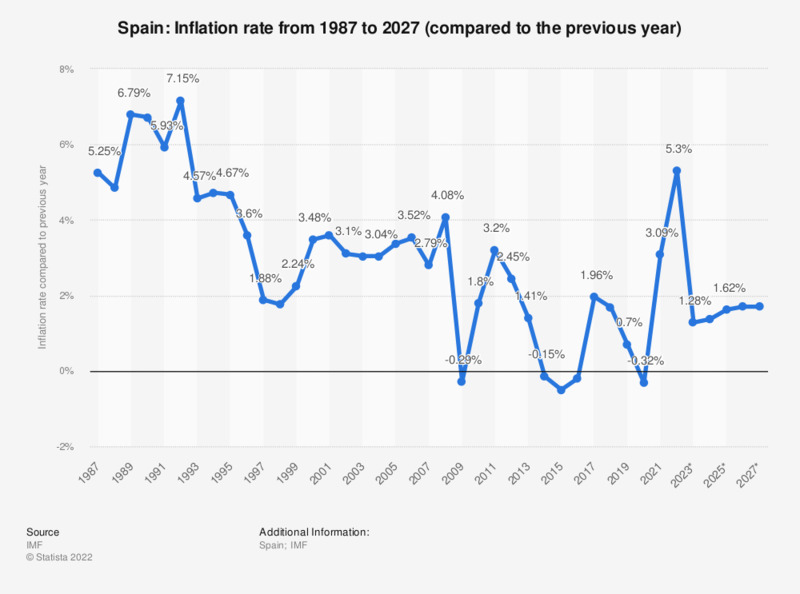 The statistic shows the inflation rate in Spain from 2012 to 2017, with projections up until 2022. The inflation rate is calculated using the price increase of a defined product basket. This product basket contains products and services, on which the average consumer spends money throughout the year. They include expenses for groceries, clothes, rent, power, telecommunications, recreational activities and raw materials (e.g. gas, oil), as well as federal fees and taxes. In 2017, the average inflation rate in Spain increased by about 1.96 percent compared to the previous year. As explained briefly above, inflation is commonly defined as the level of prices for goods and services in a country’s economy over a certain time span. It increases when the total money supply of a country increases, causing the money’s value to decrease, and prices to increase again in turn. Nowadays the term “inflation” is used more or less synonymously with “price level increase”. Its opposite is deflation, which, in short, means a decrease of the price level. Spain and its economy have been severely affected by the financial crisis of 2008 (as can be seen above), when the real estate bubble imploded and caused the demand for goods and services to decrease and the unemployment rate in Spain to increase dramatically. Even though deflation only occurred for one year in 2009 and the price level has been increasing since, Spain’s economy still has a long way to go until full recovery. Apart from the inflation rate and the unemployment rate, gross domestic product / GDP growth in Spain and the trade balance of goods in Spain, i.e. the exports of goods minus the imports, are additional indicators of Spain’s desolate condition during the economic crisis and its slow and difficult recovery ever since. Still, there is a silver lining for Spain’s economy. All in all, things seems to be improving economically, albeit slowly; many key indicators are starting to stabilize or even pick up again, while others still have some recovering to do.